Happy Halloween weekend everyone! About a month ago I realized I had no Halloween nail polishes whatsoever, so I figured I'd better fix that problem. I ended up getting two of the colors from the China Glaze Awakening collection. Today I'll show you Zombie Zest. 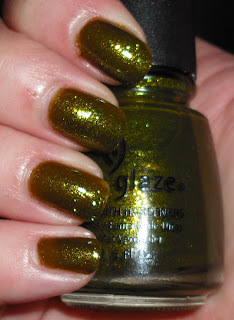 Zombie Zest is a swampy algae jelly with golden/green glass fleck glitter mixed in. I have to be honest here. I don't care for this color at all. I LOVE the finish of it. I can't get enough of jellies with glitter, but this color is like baby poop. I know a lot of people love these unusual "ugly" colors, but I'm not terribly drawn to them. I'm wearing it today for Halloween's sake, but I doubt I'll being wearing it at any other time unless I'm starring as a swamp monster in a Scooby Doo movie. I think partially this just isn't nice against my skin. :-/ Oh well. I thought I would hate it too, but it wasn't horrible on me. Baby poop haha you crack me up! I like this on you but I like this color in general. I don't own it but I do own SpaRitual's Optical Illusion, which I think it might be very close. I have this on and I love it. Baby poop, hahaha.